Samurai Long Sunnobi Tanto With Gold inlaid Tameshigiri Cutting Test Kanji for cut through 1 body.approx 400 yrs old blade length 355mm. Enjoy all. #1Submitted by kazarena on Sun, 2014-02-02 18:09. #2Submitted by Garyo on Sun, 2014-02-02 20:22. Hello Stan thank you for the translation is it unusal to have this mark on a Tanto. and if so how unusual have you seen this before ?. g.
#3Submitted by kazarena on Sun, 2014-02-02 21:45. I can't recall any specific examples, but it doesn't surprise me. 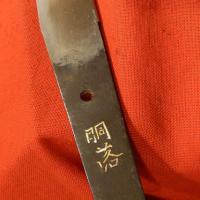 You would see 'cut through 2, 3, 4 bodies' inscription on katana and wakizashi. I don't know how they actually tested a tanto, it must have been pretty gruesome, I'm afraid. #4Submitted by Garyo on Mon, 2014-02-03 21:32.
thank you for you insight and information.and yes must have been really horrendous.Gary.